NOT many winemakers put a lot of thought into designing their wine labels. But it was Rodolfo “Opi” Sadler’s experience in his grandfather’s wine cellar in Argentina that made him decide to include embossed bat motifs on his wine labels. As a child, he recalls spending time in the cellar, which housed many of his grandfather’s special wine collection. “I remember a lot of bats flying over my head. Those bats were our pets,” revealed Sadler. Mascota in Spanish means “pet”, hence the name Mascota vineyards in Mendoza, Argentina. The name, he said, is a tribute to his father and grandfather. 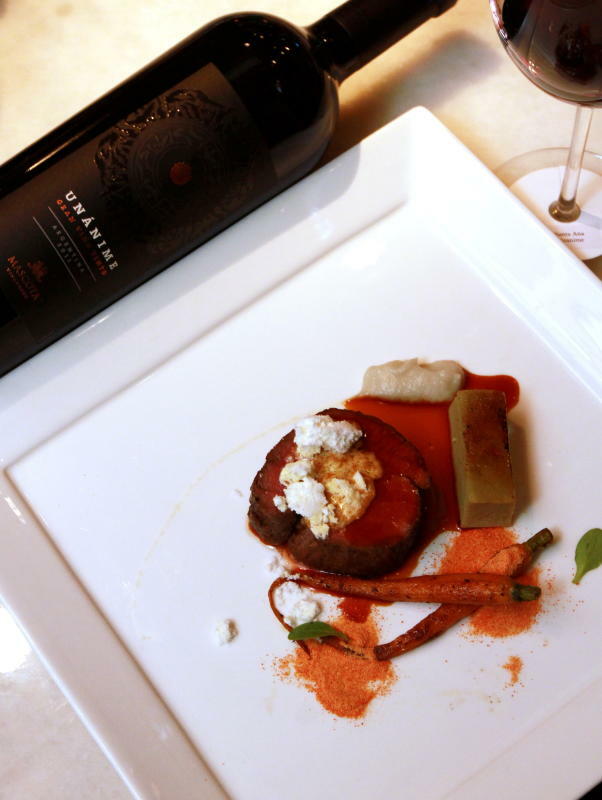 Sadler was in Kuala Lumpur to promote Mascota wines paired with an exquisite five-course dinner at Qba, The Westin Kuala Lumpur. Mascota Vineyard signature wines include Opi, Unanime, Gran Mascota, La Mascota and Big Bat. 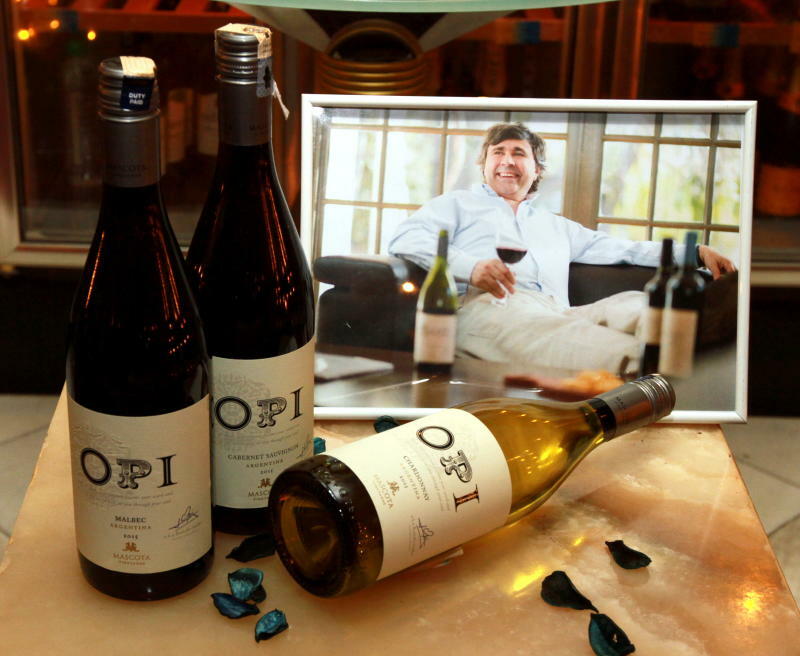 Opi range of wines comprises Malbec, Cabernet Sauvignon and Chardonnay (top pic). Located at the foothills of the Andes mountains, Mascota vineyards is just a kilometre away from the Mendoza River, where the vines are blessed with a wide temperature range. Concoctions Seafood Ceviche was paired with OPI Chardonnay. Grapes are obtained from the Uco Valley in the south of Mendoza, which are then grown on their 80ha vineyard. For Sadler, a good wine is fruity and easy to drink. “Malbec is the easiest to match with food while a cold crisp glass of Chardonnay is wonderful in summer. “If you are having a barbecue, a robust Cabernet Sauvignon or Malbec are good options,” he said. In terms of figures, 200,000 boxes of Mascota wines are exported yearly to the US, Canada, UK, Korea, Japan, Taiwan, the Philippines, Laos, Malaysia and Singapore. The Argentine wine consumption is 30l of wine per year, which makes up for two to three litres per person per month. According to Sadler, the main characteristics of Mascota wines are price and quality. As handsome as the bottle it is in, with black and gold embossed bat motif, the heady Unanime Grand Vino Tinto 2011, was in 30th place in the Top 100 Wines for 2015 list. 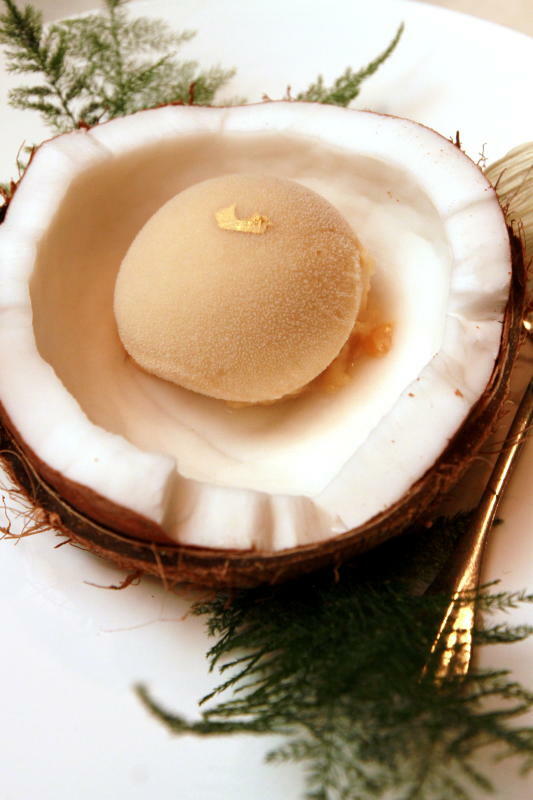 Make sure to get the Sapodilla Sorbet to cleanse your palate before the next course. Unanime in the Latin word “unanimis” means unanimous, and all of us at the table unanimously agreed that this was a delicious red. The deep cherry red wine with notes of blackberry and dark chocolate is a blend of Cabernet Sauvignon (60%), Malbec (25%) and Cabernet Franc (15%). “The Unanime is iconic and my favourite,” said Sadler. All of the Mascota wines are available at Qba and selected wine shops. 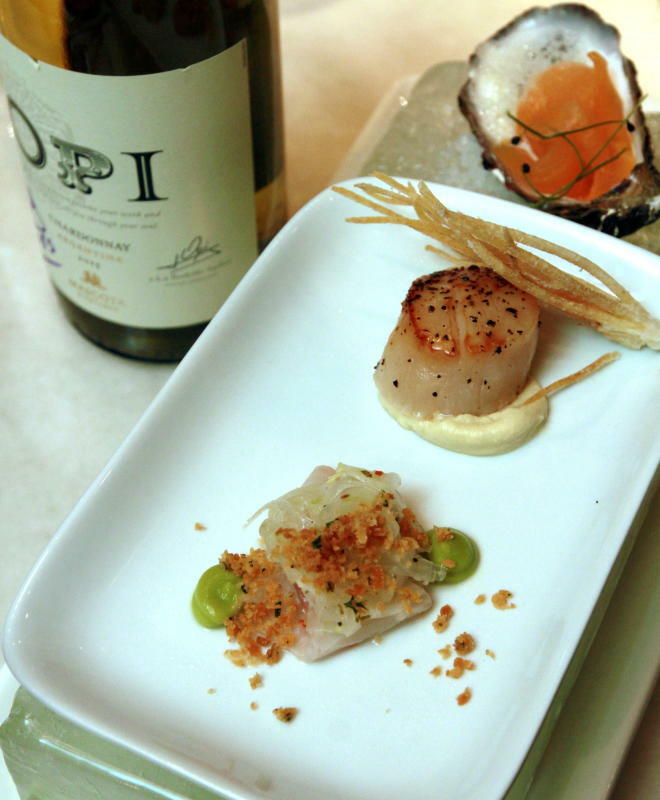 The dinner started off with Concoctions Seafood Ceviche – amberjack, fennel, avocado mousse oyster, pickled melon, horseradish air scallop, coconut mango gel and plantain, paired with OPI Chardonnay. This has hints of citrus and crisp pear and while I find most Chardonnays a bit too oaky, this was buttery and fresh. Next was the Spiced Duck Breast with polenta, peach confit, plum jus and lavender foam, paired with Opi Malbec and Cabernet Sauvignon (a bronze medal winner in the International Wine Spirit competition UK 2013). The Malbec had saturated berry flavours with sweet tannins while the Cabernet Sauvignon had soulful, robust cherry notes. OPI’s Unanime goes well with the 55 Celcius Sous Vide Tenderloin. After cleansing our palettes with a tangy sapodilla sorbet, the main attraction was the 55 Celsius Sous Vide Tenderloin with Jerusalem artichoke, onion brulee, dehydrated carrots, truffle oil powder and veal jus, paired with the luscious OPI Unanime. The wine complemented the meat and the fixings on the plate well. A great way to end the meal was, of course, with a velvety espresso mousse, caramel ice cream, cocoa pops and yoghurt foam, paired with La Mascota Sparkling. The Mascota wines are distributed by Luen Heng F&B Sdn Bhd. For details, call 03-9173 0398. 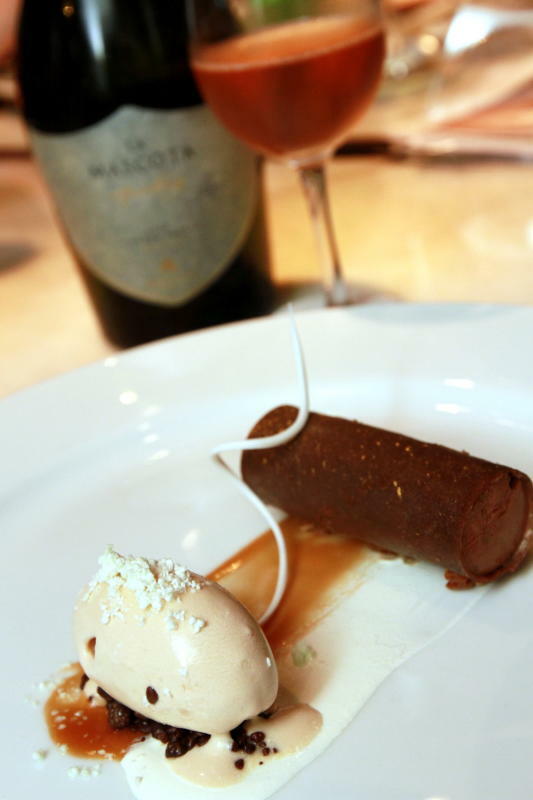 La Mascota Sparkling was paired beautifully with the espresso mousse, caramel ice cream, cocoa pops and yoghurt foam.